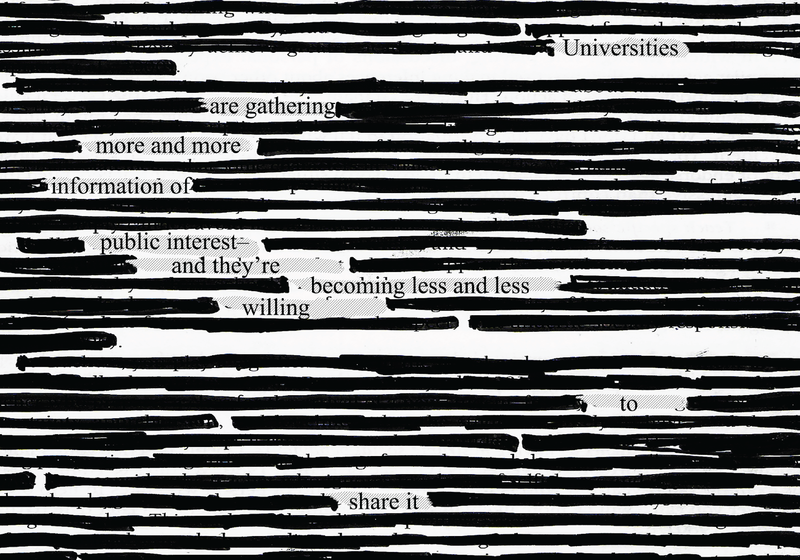 Canadian universities are generating more and more information of public interest — but they’re becoming less and less willing to share it. Chandra Pasma knew the fee couldn’t be right. The Canadian Union of Public Employees (CUPE) researcher had been sending freedom of information (FOI) requests to every public university in Canada, asking for data for a study with the Canadian Centre for Policy Alternatives. Many universities, including UBC, had already disclosed the information for free. Now, Dalhousie University was asking for $14,000, just to know how many contract faculty the school had hired. “They actually sent me four years of data for free,” said Pasma. “And then they said if you want the rest, it’s going to cost you $14,000." She appealed to Nova Scotia’s Information and Privacy Commissioner, the province’s oversight body for FOIs — requests for information that public institutions are beholden to answer under law. It turns out she was right, Dalhousie had miscalculated the costs. The actual fee they were demanding was $55,000, the largest in the province’s history. Dalhousie’s exorbitant fee is indicative of a much greater problem. Canadian universities are generating more and more information of public interest — but they’re becoming less and less willing to share it. Universities across Canada have been receiving more and more FOIs, ranging from requests for personal medical records to details on research partnerships. But many universities are having trouble keeping up. “It’s sort of a Canadian trend,” says Mike Larsen, president of the BC Freedom of Information and Privacy Association (FIPA). But as more and more people are using FOI — and as campuses continue to be the subject of interest and scandal — universities are struggling to return requests within the legal timeframe, making it difficult to hold them accountable. Larsen says that a number of journalists and other requesters have contacted FIPA with complaints about universities, often because of poor service, ignored requests or untenable delays. At UBC, which received a record-setting 393 FOI requests in 2017, an average request in 2018 took 151 days to close according to UBC Privacy and Information Counsel Paul Hancock. In BC, the default time for returning a request is 30 days. Hancock says those delays stem both from the quantity of requests and the growing “complexity” of some inquiries for records. “Since 2012, the number of records retrieved for each request has doubled,” said Hancock. Larsen says this “complexity” is likely related to records that the university is unwilling or cautious about publicly disclosing — like partnerships with external organizations, contracts or investigations on sexual assault and related policy. “These kinds of requests tend to get more scrutiny, more eyes on them,” said Larsen. “FOI officers know FOIs have a clear public exposition implications for the institution. UBC isn’t the only university seeing an explosion in the number of requests. McGill received 160 FOI requests in 2017, compared to 114 the year before. At the University of Toronto, the number of requests nearly doubled from 54 in 2016 to 101 in 2017. The growth in requests is likely due to increasing information literacy — namely, that more people know about FOI requests, are more are willing to use them. The largest single category of requester at UBC behind law firms is consistently private citizens, not journalists. “Increasingly, we’re finding that requests for information on complex topics that have traditionally been dominated by ‘traditional media’ are now being made by private individuals,” said Hancock in a written statement to The Ubyssey. “People are using FOI for exactly what it was intended to do, which is to see what institutions are up to and how they’re making important decisions,” said Larsen. But as Pasma learned firsthand, universities aren’t willing to easily part with that information. She sent three FOI requests to each of the 78 publicly-funded universities in Canada. The requests were for the number of full-time tenure-track, full-time contract and part-time contract faculty broken down by department. Aside from some being filed in French, the requests were identical. The result was Contract U, a nationwide report on the number of contract faculty in academia that unintentionally reviewed the state of access to information in Canadian universities. And many schools got a failing grade. Of the 78 institutions contacted, seven charged fees that CUPE considered inappropriate, like Dalhousie’s $55,000 figure. Another seven refused to disclose part of the information. And eight refused or failed to provide any information outright. Pasma says that at some schools, the failure to respond was simply a lack of capacity: many of the schools don’t have an FOI department or attached their offices directly to the office of the university counsel. They couldn’t even find the files she needed. Larsen says universities often have to balance a huge variety of records ranging from employment files to academic records — and usually aren’t very good at it. “I have not known universities to be the most effective or efficient in terms of record management in my experience.” said Larsen, who is also professor of criminology at Kwantlen Polytechnic University. At some of the offices Pasma contacted, the FOI office was only one person held that role concurrently with other positions. “There’s no malice or attempt to obstruct the law or anything,” said Pasma. “It’s a tiny department with people with other responsibilities or things to worry about and the request just flew by. Pasma describes a few methods that offices used to slow or stonewall her research: dues, denial and delays. Some requested what she called “nuisance fees” — huge fees for providing simple records, often demanded as soon as she contacted them. “I received a letter sent right off the bat that says, ‘Sure you can have the information, that’ll be $8,000,’” she said. Others denied to provide the records outright. “McGill University refused right out the gate, and then wouldn’t even respond to my email when I sent a response to their refusal,” said Pasma. Their argument was that the records she requested did not already exist, therefore they weren’t obligated to collect the information. McGill University did not respond to a request for comment. For cases like this, organizations can be compelled to release information via an appeal to the respective province’s privacy and information commission, which can easily take months. It’s a second ivory tower — institutions that create knowledge, but don’t want to share it. And it’s not just a problem at universities. “Post-secondary institutions as a whole are allergic to accountability,” said Sean Holman, an expert on Canadian FOI law and an assistant professor at Mount Royal University. Holman says says delays that occur when obtaining information from universities mirror systematic issues in the FOI system as a whole, noting that a lack of interest from the federal government and a lack of pressure from the public has allowed institutions to avoid transparency. The most common problem with obtaining FOIs are delays, according to requesters. In 2017, the University of Alberta received a slap on the wrist from the province’s privacy commissioner for the staggered release of FOI records. The same year, UBC was the seventh most-complained about public organization in BC according to the Office of the Information and Privacy Commissioner, a public oversight body that ensures the BC Freedom of Information and Protection of Privacy Act (FIPPA) is properly applied. “It does seem that UBC is in a particularly bad place,” said Larsen. There are a number of reasons why UBC has been particularly impacted. Unlike requests in other provinces such as Ontario, filing FOIs in BC is free. “I have no doubt that default fees, even nominal ones, would reduce the number of requests we receive,” said Hancock. UBC is also the largest university in BC in terms of student enrolment, international ranking and endowment, which means both that it's of interest to media and the public and that it occasionally sees its fair share of scandal. The office has tripled its number of FOI staff since 2013 — but in the same period of time, the number of requests has quadrupled. But some say that UBC is exploiting the number of requests it receives to avoid releasing files that could harm its reputation. Joey Hansen, executive director of the Association of Administrative and Professional Staff (AAPS) at UBC says the bogged-down FOI office meant he couldn’t obtain records AAPS members needed to file human rights complaints against UBC. Because the BC Human Rights code requires complaints to be filed within six months of an incident, the AAPS had to file eight requests without the potentially vital records. “I believe it was the university using the fact that it broke one law to protect it from the fact it broke a second law,” said Hansen in a October interview with The Ubyssey. UBC maintains that it processes all requests in the time it takes to file them and that it has won a majority of cases before the OIPC. But Pasma noted during her research that it was often smaller institutions that were the worst at returning information. Some offices, she said, barely acknowledged her request or required multiple follow-ups to get the information. As of the writing of this article — 14 months after she submitted her initial round of requests — Pasma has yet to hear from several schools. There are multiple good reasons for barriers to access. Some information, like personal medical records, isn’t meant to be released. But FOI experts like Holman say these exceptions are being taken advantage of — not just by universities, but by public institutions as a whole. He says that a lack of scrutiny from media and the public creates a vicious cycle: institutions aren’t pressured to release information, so they never get in the habit of doing it. “One of the reasons they’re allergic to accountability is that no one is holding them accountable,” said Holman. On the surface, nothing looks wrong with the University of Toronto’s (U of T) Access to Information and Privacy office. The only irregularity is that the number of requests submitted suddenly doubled from 2016 to 2017 — but the number of files closed barely shifted. That might be because it took measures to muzzle its most frequent requester — the student newspaper. In January 2018, Jack Denton, then the news editor of The Varsity, was called into a meeting the University of Toronto President’s boardroom with the school’s information officer. He demanded that Denton withdraw over 40 FOI requests The Varsity had submitted the previous year — or else. Denton submitted 43 FOIs to U of T over the course of a few months, which he says stemmed from a lack of transparency from the university and a desire to do more critical, investigative reporting. The university didn’t share his enthusiasm. It sent a letter later that year with an ultimatum: The Varsity would have to withdraw all of its standing requests and agree to a ‘cap’ of five requests at a time. The university cited a previous IPC order at the University of Ottawa where an individual who had submitted dozens of requests to the school was forced to withdraw their requests and agree to a cap of one at a time. Denton says U of T implied the requester had been a student paper — but neither The Fulcrum nor La Rotonde, the two official newspapers at the school, have such an agreement in place with the school. The IPC also confirmed that the appellant in the case was an individual, not a newspaper. The grounds in that suit were that the requests submitted to the U of O were “frivolous and vexatious”: essentially, that they were made in bad faith and didn’t actually request pertinent information. Earlier this year, the Association of Canadian Journalists condemned U of T for rejecting a request for an interview from a journalist at The Ubyssey on the grounds that U of T does not speak to student media beyond its own. U of T isn’t the first school to attempt to block its student journalists from filing requests, either. In 2014, McGill requested permission from Quebec’s privacy commissioner to disregard FOI requests from students altogether (the commissioner declined and McGill never enacted such a policy, a media representative confirmed). U of T declined multiple requests to be interviewed for this article, citing that it “treats communications with requesters and the identity of requesters as confidential,” in an emailed response. The university also did not respond to multiple follow-up requests on the number of FOI requests it had received or its policies towards requesters. U of T maintained a policy earlier this year of not communicating with student media beyond The Varsity. Denton insists his requests were valid, but says The Varsity agreed to the agreement because they couldn’t afford a legal battle with the school and feared it would affect their ability to report. “[Fighting it] was not really something we were in a position to do,” said Denton. Since then, The Varsity has informally agreed to only submit five requests at a time. Denton says their staff finds ways around the strict cap.